Before a recent visit to Los Angeles, I’d heard a lot about Sqirl, a quirky restaurant with a funny name. People were imploring me to go. So much so, that if I didn’t, I’d be racked with guilt for the next five to seven years. (Which I think was the intended effect.) Whatever it was, it worked, and when planning to meet up with a friend, I suggested we go there. Since he lived in Silverlake, he was familiar with Sqirl, and said we should go mid-morning to avoid the lines. I’m of the age where I don’t want to wait in line anymore to eat. At least I thought I was. Yet there I was, standing on the sidewalk at 10:30 am, waiting in line to get in and order. It helped that the weather in L.A. is often spectacular, so standing on the sidewalk while you wait for a table is not the same hardship it is in New York or Paris, in the winter. My friend and I lived in San Francisco for a long time, so we’re food snobs of the highest order. I’d been coached to try the sorrel pesto rice (below). And, once again, to avoid any guilt, we ordered one of those, as well as a few others things to try. While we waited for our food, I was sipping my first Turmeric Tonic (which was excellent; I hadn’t ever had turmeric tonic, as hasn’t quite hit Paris yet), while feeling very good about myself, and my health. Then I took my first forkful of the rice bowl the server brought over. We both stopped talking and looked at each other, nodding in silent agreement over how good it was, and continued to dive in; it was one of the best things I’d ever eaten, and one of the few things that lived up to the hype. 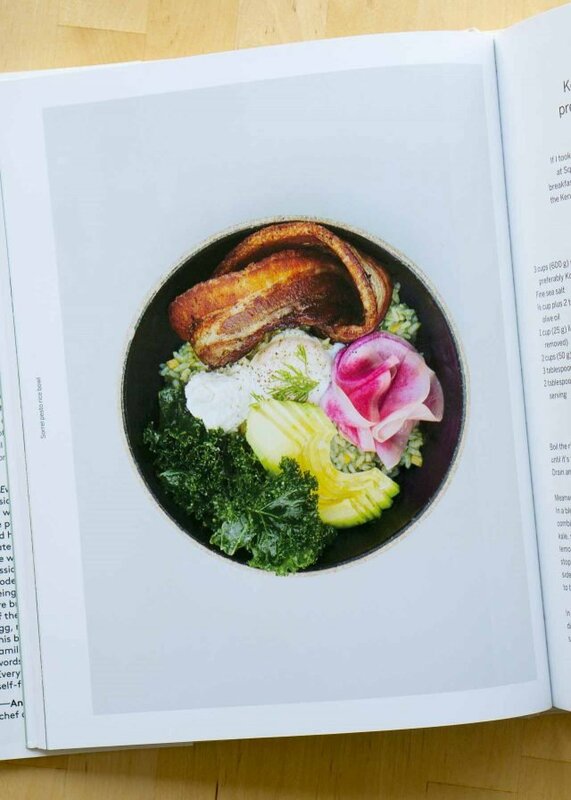 Each mouthful was a Gordian knot of overlapping flavors—tangy sorrel-pesto rice, bright watermelon radishes sliced rapier-thin, salty sheeps’ milk feta, bursts of fresh dill, preserved Meyer lemon, creamy avocado, a tangle of bacon, with a poached farm egg resting amongst the other ingredients in the bowl. I have a funny sixth-sense about food, and usually tell if a restaurant is good even before I walk in. At Sqirl, there is usually a line to get in, so it was a little easier to gauge that ;) But when we’d finished ordering and the counterperson asked if we wanted desserts, the ones in the glassed-in case didn’t have the appearance of being anything special. However there was something intriguing about the almond cakes with a few sunflower seeds scattered on top, and the somewhat plain-looking pudding cakes, so I ordered one of each. As they say in Southern California – like, oh my God!…were those ever good. Happily the Malva Pudding Cakes are also in this engaging and user-friendly book. The book says when you serve these, everyone will ask where the recipe is from, so I’m here to tell you they’re from Sqirl. And they’re terrific. You’ll need to work fast when the cakes come out of the oven to get the cream mixture into the cakes. Make a small slit in the top with a sharp paring knife and pour some of the cream into each cake, until it reaches the top. Once you’ve reached that point, stop and move on to the next one. Then go back and pour enough of the cream back into each cake until it just reaches the top of each individual cake, but no more. I overdid it the first time I made them, so sent Jessica a message, asking when to stop pouring. She told me to “let the liquid in, in a pace where you can see it absorb, then add more.” She stops when she sees it staying on the surface, and not absorbing further. So you may have some of the cream mixture leftover. 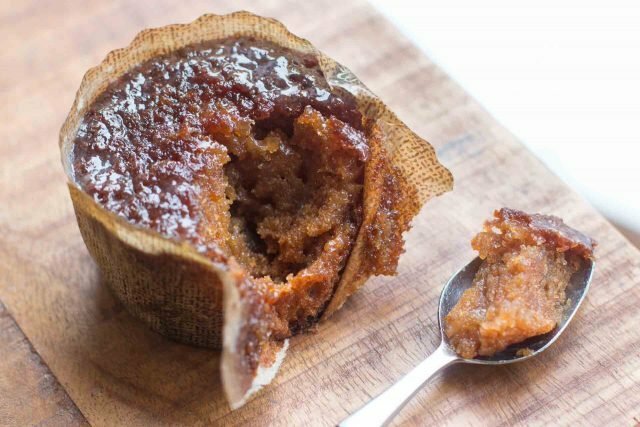 These are are the sweet side (think sticky toffee pudding, but without the dates), but are small in size, so you don’t have to feel too bad about indulging in one all by yourself. 1. Preheat the oven to 375ºF (190ºC). Set 8 small panettone molds on a rimmed baking sheet. 2. In a small bowl, whisk together the flour, baking powder, and baking soda. 3. In a bowl of a stand mixer fitted with the paddle attachment, or by hand in a medium bowl, beat the sugar, eggs, and salt on medium speed until the batter is thick and pourable, like a melted milkshake, about 2 minutes. Reduce the speed to low and beat in the jam until incorporated. Then mix in the melted butter and vinegar. 4. Add one third of the milk, then half of the flour mixture. Then add another third of the milk, then the rest of the flour. Finally, add the rest of the milk and stir until smooth. If there are large lumps, whisk it briefly, just enough until the batter is smooth. 5. Pour the batter into the 8 molds, which will fill them a little more than halfway up. Bake the cakes until they are deeply bronzed across the top, 35 to 40 minutes. The cakes need to be well-baked, or as Jessica says, "...almost overbaked - in order to soak up the filling." 7. When the cakes come out of the oven, using the tip of a paring knife to poke and pull back a little flap from the middle of the top of each. Poke the knife in the cake to make a little space inside and pour enough of the filling in each until the cakes can't take any more of the filling. 8. Once you've filled all the cakes, go back and repeat the process, filling the cakes with additional filling just until it reaches the top. You may have not use all the filling but don't worry if some spills over. Serving: Serve the cakes warm. They need no accompaniment. Storage: The cakes can be made up to two days in advance, although are at their best served the same day they are made, preferably warm from the oven. You can rewarm them on a baking sheet in a 325ºF/160ºC oven, until they're warmed through. Reading this recipe was like a trip back 20years for me. 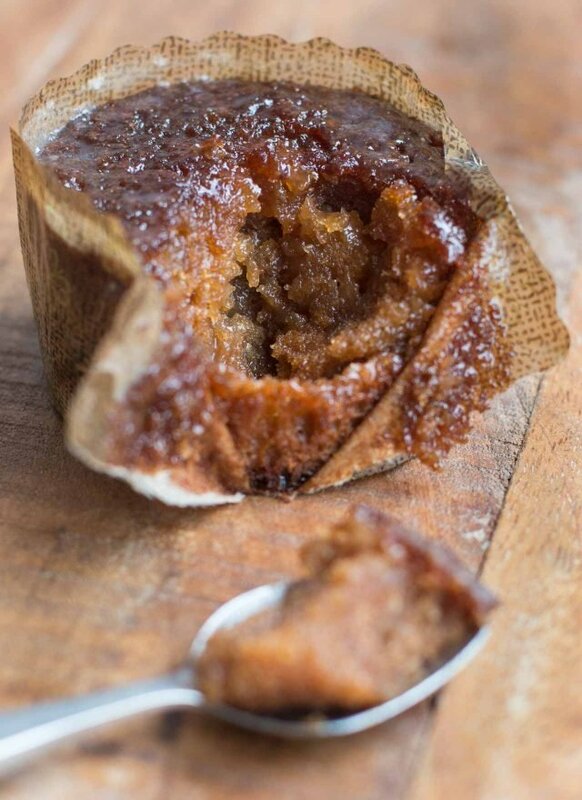 Malva pudding is a South African dessert originating from the “Boer”/Afrikaans culture there. It’s in a few South African cookbooks and is always delicious. Amazing to see that it’s now attained gourmet and international status! I often bake malva pudding as it reminds me of the sunshine and blue sky days of South Africa. 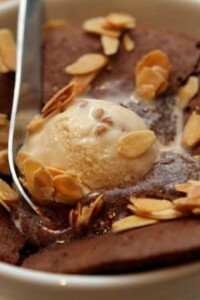 It is delicious served with custard, ice cream or caramel sauce. Decadence at it’s best! I wonder if I could bake these in crème brulee ramekins? They might be a little on the shorter, squatter side. Interesting, especially the note about the South African origins. Kind of like savarin, with a butter/cream bath replacing the rum syrup. Would be interested in replicating that rice bowl. Hint, hint. Ah – malva pudding. It originates in South Africa (as far as I know) every South African will tell you that. I have made individual ones and big pans of it and everyone loves it! (I’m a South African living in France. :-) ). Hi David, What GF flour would you recommend for this? Also, would love the recipe for the rice bowl, too. Merci. Do you think these could be made using porcelain ramequins like for pots de crème? It feels they might be easier to eat from. Savannah and Nathalie: I only tried them in panettone molds and cupcake cups. 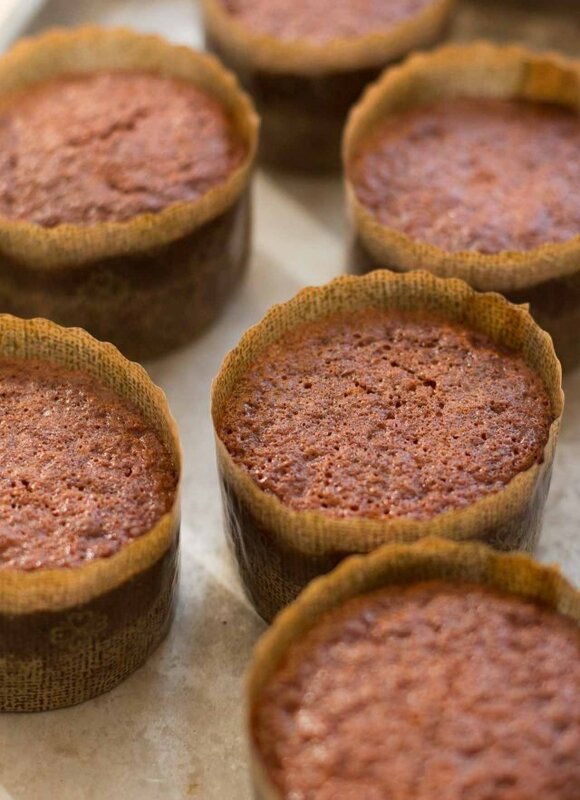 But if you try them in ramekins or custard cups, let us know how they turn out. 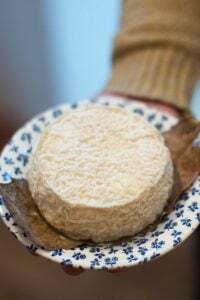 Julie and Taste of France: I only feature one recipe from a book on the blog, but the recipe is in the book (which is pretty terrific), and you may be able to find it elsewhere. I’ve never used gluten-free flour blends but perhaps someone else could chime in with one they like? 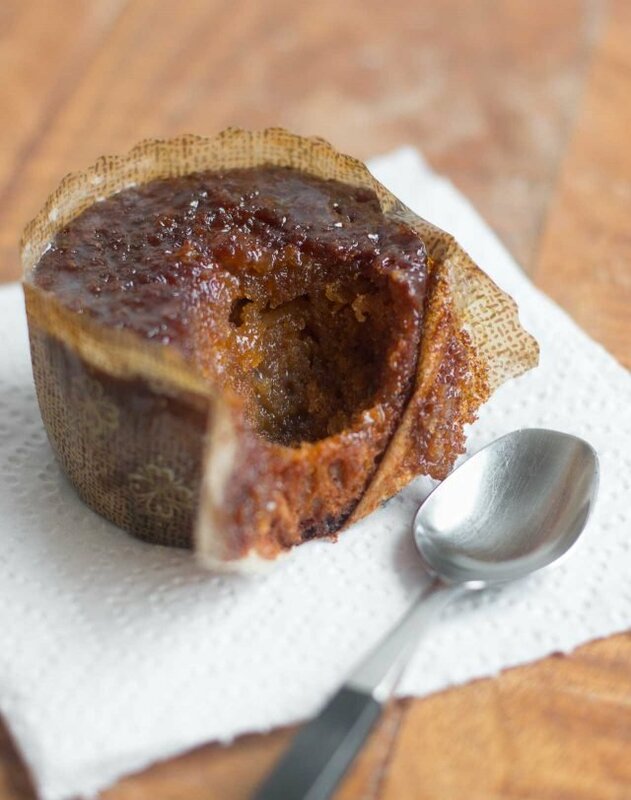 Malva pudding is traditionally served in a large dish but i often make them in ramekins. Just need enough space for the “sauce”. JAN restaurant in Nice serves malva pudding pops on rosemary skewers! David, LOL at the prospect of your being “racked with guilt for five to seven years” for NOT trying a restaurant. 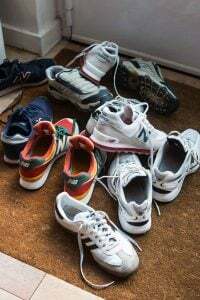 (Other people are more likely to be racked with guilt for doing bad things.) I needed that laugh very much as I enter week 3 of the flu and losing my sense of humor about it. Food blogs have many uses. Thanks for your always-inspiring blog! No. 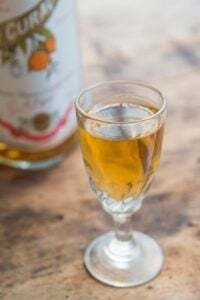 They must include vinegar and it is often called vinegar pudding in South Africa. Strained apricot jam means I am using mostly the chunks of fruit with a bit of smooth jam attached? Is that correct? Maybe my brain isn’t working or maybe the picture looks like unstrained jam, but please advise, this sounds so good. I can’t wait to try the recipe. Strained jam means to press the jam through a meash strainer, which disperses or breaks up, any lumps of fruit. David, Thanks so much, that makes perfect sense, guess I was just making it complicated. I really enjoyed your last book. You really captured the sense of how difficult it can be to deal with some of those kinds of situations. And I can’t imagine how hard it would be to deal with those people when the language is not your first. Good thing you have your Romain! David, I just finished your new book. Loved it! Off to order that cookbook!! This recipe looks amazing! I have a question about the butter in the filling. Since we’re going to melt the butter, does it have to be room temperature? It would be easier to just take it out of the fridge. Thanks David for another spectacular dessert from a place in LA where my daughter lives and will visit next I fly there. But most of all thanks for adding to my huge library of cook books as recommended by you. I think more than half were ordered from your recommendations. My husband thinks I need to open my own library. Hate to think of what will happen when we move in the next few years. I will guard them with my life. I’m so happy you liked it. (Handstands!) I knew Sqirl when there were only a few people at the counter, wondering if & when (hoping not) it would close. So many great restaurants in LA have gone that way (just backspaced.) I’m a native. Now the paps make it so hard. Oh wow I love the texture – looks delicious! This is the ultimate classic South African dessert. Decadent and delicious, also known as vinegar pudding. We serve it with heaps of whipped cream. 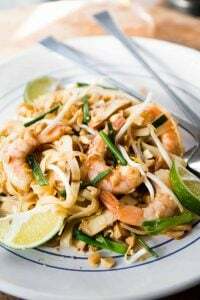 It is one of the most requested recipes in my cookery school when i do a south African themed lesson. You need to taste koeksisters, melktert, cape brandy pudding now. Another South African! Just bake in a a suitable sized dish. Make sure that it is well cooked otherwise it will be too soggy. OMG! 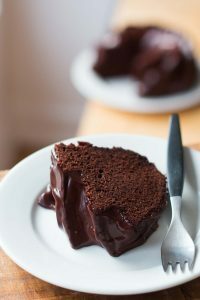 This looks sooo decadent!!! Your book was reviewed the Sunday New York Times book review section. I did not agree with the negative comments because I loved the book as it is but any publicity in the NYT has to be good. Wondering how to pronounce sqirl. David, I loved you already, but can I love you any more? The Gordion knot comment reminds me of why your writing is so entertaining! Thanks!! 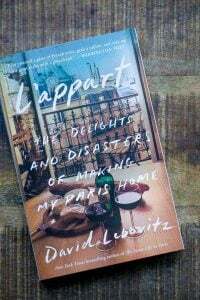 I’ve also read L’appart, loved it as it mirrored some of my challenges emigrating and immediately passed it on to my French teacher who’s married to a Brit (for eons) and she too enjoyed your take on France and the French. So, there are two Kudos for you! 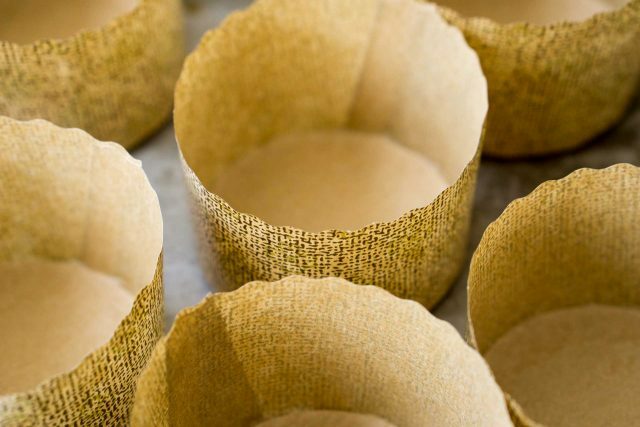 Looks like a tea cup or coffee cup might be the right size to bake these in. I pick odd ones up at resale shops to bake in and give stuff away. Don’t have to worry about getting the container back either. Question is would the cups need to be greased? 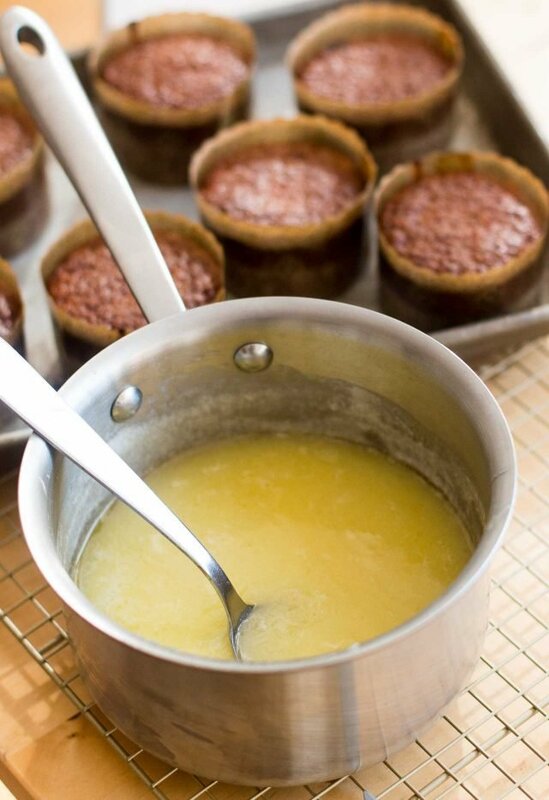 The paper mold can be pulled away but what about other baking vessels? 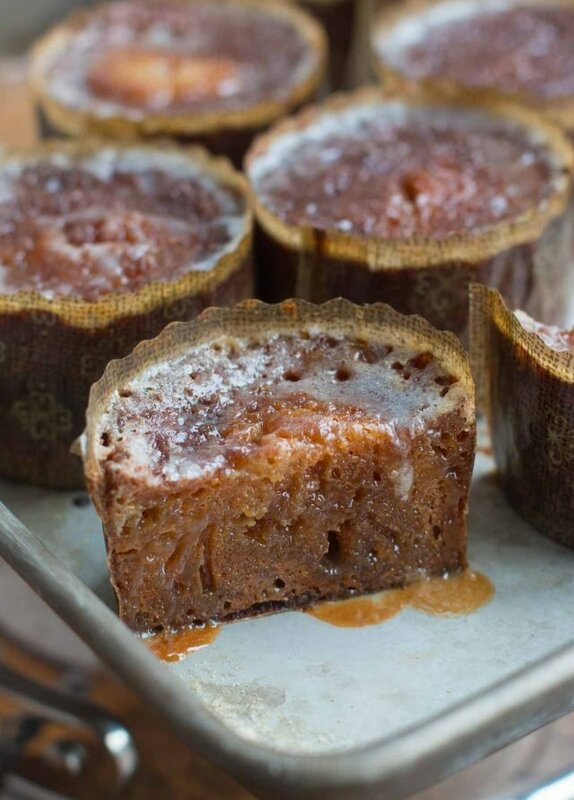 Your recipe suggests that malva pudding (as it is known in South Africa) needs no accompaniments but in South Africa it is served with pouring cream or ice cream or custard. 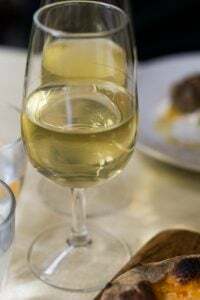 The recipe is thought to have originated in the kitchen of the Boschendal wine estate outside Cape Town in the 1970s. I was fortunate to eat it there for dessert on several occasions when my family ate lunch there. It was utterly heavenly and the dessert’s reputation spread from there. Madeleine: I found these quite rich, with that pour of buttery cream in the puddings, but if you’d like to serve it with additional cream (or ice cream, or custard), you certainly could. Nikki P: I didn’t try baking it in another type of vessel, but suppose you should butter tea or coffee cups; make sure they can withstand the heat of the oven before you bake in them. If you try those. If you do, let us know how they turn out. 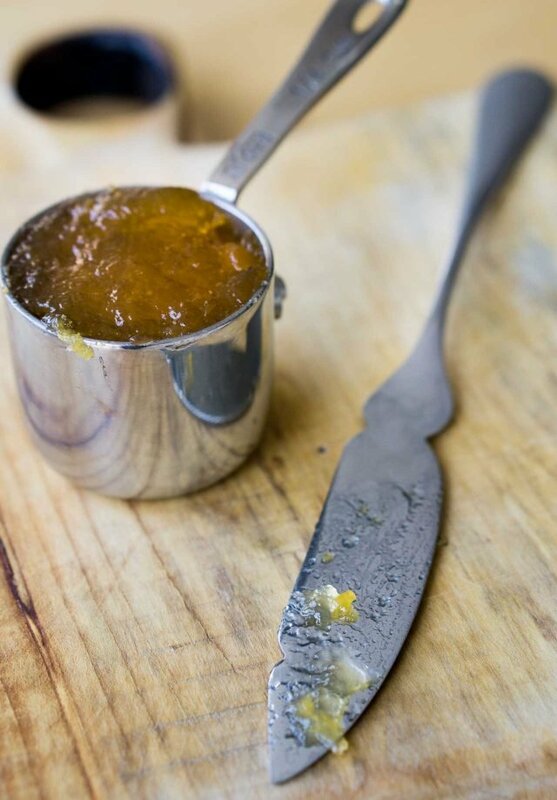 As a South African who includes this pudding just about everytime I have guests, using honey instead of jam is equally delicious. Serve the left over sauce in a jug. It wont last long! Delighted to see the words ‘Malva Pudding’ pop into my inbox this morning! Loved reading about your experience and this incarnation! Wow, thanks so much for sending your article…and writing it. I didn’t know the history or lore of the puddings and your story was really fascinating. Appreciate your sharing it! Thank you Nikki what a beautifully written article. I think at one time you could pick up a copy of the recipe at Boschendal. My MIL has the recipe typed out on a Boschendal letterhead. This whole thread is making me so happy. Malva pudding sounds delicious and I can’t wait to make it. Nikki, your article was fascinating, and I’m enjoying Googling all the South African recipes mentioned in the other comments here. I ate at Sqirl (it’s within walking distance of my parents’ house!) back in December and my husband and I were very impressed. The pudding cake was delicious! Very rich and sweet, but absolutely delicious. Thank you for providing the recipe! Can’t wait to try it. I have been resisting buying Squirl, but may have to get it. My local Whole Foods has fresh Tumeric, so now I have a use for it. Thanks for posting the recipe! Malva is the Afrrikaans work for both marshmallow ( the cake can have a marshmalloy texture) but also the word geranium Some very old recipe variations/references will use the rose scented geranium as a flavourant. Stick it in theh pan before pouring in the batter. Dont eat the leaf as its bitter, but will make the whole thing mildy victorian . Is that an All Clad butter warmer in one of the photos? It’s an All-Clad measuring cup. I was given a set a couple of years ago and I think they’re cute – like mini-saucepans! They ARE cute. Mine don’t have the rolled lip like your’s but I noticed they have the star-like highlighting on the bottoms just like the bigger cookware does :) I’d never noticed that before your post. Thanks David. This looks delicious and I can’t wait to try it. I wouldn’t worry about San Franciscans, they are seldom nervous and they will never concede, lol. Yes Malva Pudding is a favourite in South Africa. 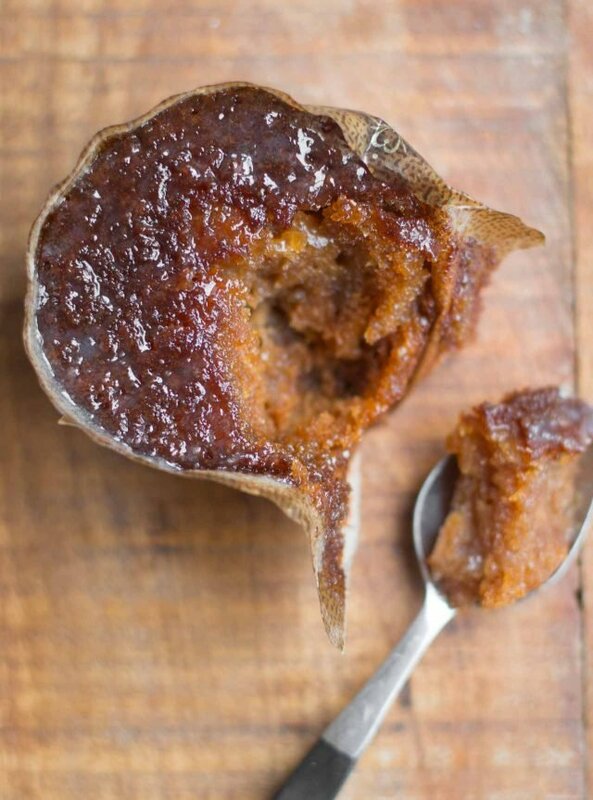 We in the Northern Cape ate malva Pudding long before it was a favourite in Boschendal, where Maggie Pepler made it. I can sent you the real South African recipe, if you want it. I disagree. Malva puddng and Vinegar pudding are two completely different puddings. Just finished baking the Malva Pudding Cakes and eating one. It was very hard not to eat more. My husband just finished his second one. So yummy! good old Malvapoeding, when i first saw the photo and the headline, i was, so, that’s not new, only today do isee it’s you,t so cool. 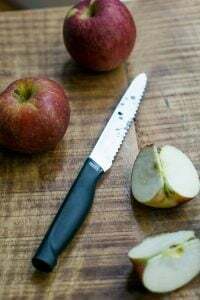 i love to place a slice of pear in the bottom of the “cup” and add brandy to the sauce, sometimes I :”toffee” it up a bit. LEKKER!! I used the leftover Malva cakes filling for French toast this morning and it was quite tasty. I mixed 1/2 cup / 1.2 dl filling with 2 eggs and some cinnamon to coat the bread. altho i’m aiming to make these goodies, i have a question on another receipe – the almond cake adapted from “chez panisse desserts”. i made it this morning for the first time and all seemed to go easily according to plan, but when i baked it (10″ spring form pan buttered and floured), the sides rose much higher and the middle stayed low. it didn’t sink when it came out of the oven, but was that way while baking. i haven’t cut into it yet and am assuming it will be delicious, but just curious what you may think about it looking pretty opposite from your photos with the recipe. fyi the low center of the almond cake will nicely hold the cinnamon ice cream (from The Perfect Scoop) with a drizzle of caramel sauce over it all. thanks for all of your wonderfully presented and inspirational recipes. i always am happy when i see you in my inbox!!! 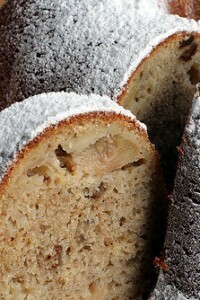 I don’t know much about high-altitude baking but cakes that rely on leavening (as that one does) may need adjustments. Unfortunately that’s a specialty area of baking that I’m not familiar with so can’t advise. You might want to check the books of Letty Flatt or Susan Purdy as they may have tips for conversions. These are fabulous! They did erupt over the top of the panettone molds, but the excess was easily scraped off. My attempt to make the 8th in a cupcake liner failed – perhaps if I had put it in a muffin tin it wouldn’t have collapsed. There’s a very common and much easier way to make these. You liquidize a can of fruit cocktail with eggs, flour etc. Super quick and just as delicious. Oh yay Malva pudding. I always thought only South Africans knew about it. I like it with custard. i made quite a few of your recipes already so when i came across malva pudding i picked up your version. made it today in a single large pie dish. reduced sugar in the cake and the filling by half, reduced butter in the filling by half. served the cake after family lunch, it came out excellent, everyone asked for seconds and i had thirds. Delicious! I made a half recipe (since it seems these are best eaten fresh) and we very much enjoyed them. I realized belatedly that they are very much like a childhood favourite, “mandarin orange cake”, which is built around one of those little cans of mandarin orange segments rather than apricot jam (it was the 70’s!). It’s a very similar batter, and the warm sauce that you pour over the hot cake involves brown sugar, milk and butter. The most sought-after pieces were always the corners, which were thoroughly soaked by the warm caramelly sauce. This has inspired me to give mandarin orange cake a try in the little panettone molds – I suspect it’s the ideal format for this kind of cake, allowing each one to be both properly cooked and thoroughly moistened by the sauce. Thank you for sharing this recipe and for prompting recollection of this happy memory! David, the website of thé pop-up restaurant is not set up to accept réservations after 14h45, not even on thé 23rd. They need to adjust their hours on that day. Yes, the dinner sold-out so that’s perhaps why the website is not showing reservations available. I love these! We have a South African tea house on Queen Anne hill, here in Seattle. It’s called the Cederberg Cafe. They specialize in “Red Espresso”, Rooibos tea that has been ground up and is made using an espresso machine. They make lattes with it. Their Malva puddings are little loafs. These tasted amazing with marmalade (I was fresh out of apricot). I left the orange peel in and loved it.